PITTSFORD — Practice No. 1 is in the books for the Buffalo Bills. A large crowd filled both sets of bleachers surrounding the grass field at St. John Fisher College as the Bills opened their 2017 season with the first practice of training camp Thursday night. "You take a couple minutes to kind of sit back and look around and say, 'you know, this is what you work for.' This is what I've worked for in my career," coach Sean McDermott said. "I'm comfortable. I really am ... I'm excited to get started. It's for real." 1. The book isn't closed on Anquan Boldin. The veteran wide receiver, who made a free-agent visit to the Bills on Monday, remains unsigned. General Manager Brandon Beane said Boldin is currently weighing his options. "We had a great visit," Beane said. "He is a great young man. Obviously a man of the year. They don't just hand those out. He is the type of character, type of person, type of man, type of football player -- he plays with a physicality -- those are the types of things that we see and know about him. "He has options as well. I know he's considering that from his end, and that's really all that I can tell you at this point." 2. 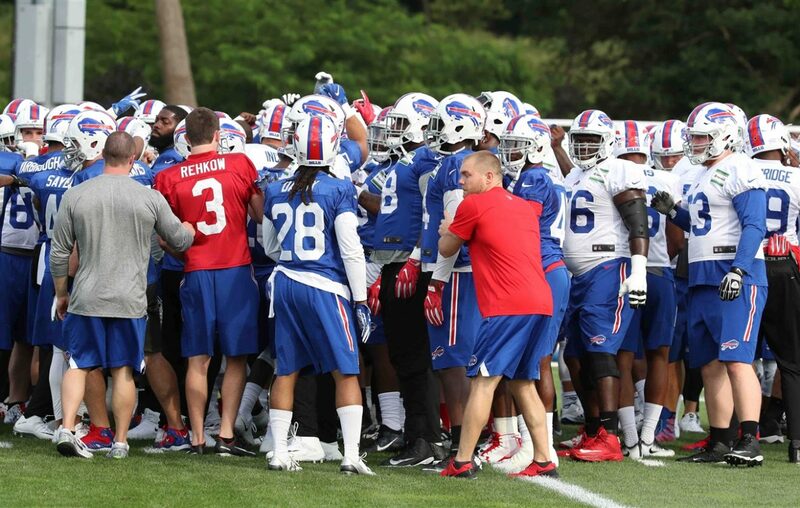 The Bills are healthy to start camp. Just one player -- safety Colt Anderson -- is on the active/physically-unable-to-perform list. Coach Sean McDermott said Anderson, who worked out with trainers on the sideline, is week-to-week with a sprained foot. The other 88 players on the roster took part in practice. Offensive tackle Seantrel Henderson left with a trainer, but returned about 10 minutes later, while defensive tackle Jerel Worthy left the practice a few minutes early, possibly for a cramp. 3. Dion Dawkins will work at both tackle spots. The rookie second-round draft pick worked on the left side during training camp as starter Cordy Glenn sat out because of an ankle injury. Glenn, however, was back Thursday night, with Dawkins switching over to the right side. He lined up with the second team, behind Jordan Mills. Henderson, who has to serve five more games of a 10-game suspension handed down last year, got some first-team reps at left tackle behind Glenn. 5. Sammy's first practice looked good. The Bills' No. 1 receiver, who was limited in the spring as he recovered from a second surgery on his left foot, made a contested catch in front of cornerback Ronald Darby. After the practice, Watkins said his foot was fine. He also said he wasn't upset that the team didn't exercise his fifth-year option and that his job was to "go out there and earn it" this season. 6. Tyrod Taylor takes over. Starting quarterback Tyrod Taylor huddled up the offense after a rough stretch that included a few dropped passes. "More of a refocus," he explained afterward." At that point of the practice, it was probably about halfway through, there was some good plays, some plays that weren't so good -- a couple up-and-down plays. Like I told the team, consistency is what we need to be better at for us to get to where we need to go. That's something we have to work at each and every day." Taylor's best throw on the night came during a 7-on-7 session to Holmes. A well-placed pass couldn't be caught by Holmes, who was slow to get up after diving to try and make the catch. 7. Adolphus Washington mostly sidestepped questions regarding his arrest earlier this month. The defensive tackle frequently said he "can't really say much" about the situation, but admitted that he did wonder if it would cost him his job. Both Beane and McDermott said they were disappointed, but thankful that nobody was hurt. 8. Stephen Hauschka gets off to a good start. The Bills' new kicker went 4 for 4 during the special teams portion of practice.